Press and hold the (distance) button for one second. 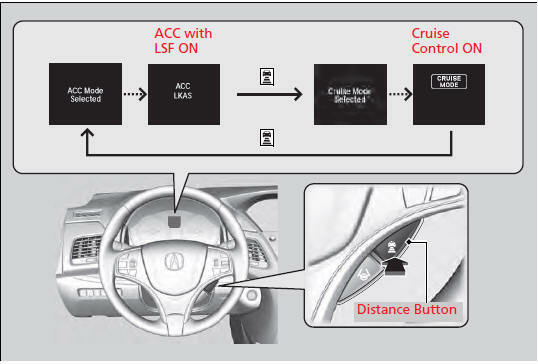 Cruise Mode Selected appears on the multi-information display for two seconds, and then the mode switches to Cruise. To switch back to ACC with LSF, press and hold the button again for one second. Always be aware which mode you are in. When you are driving in Cruise mode, be more cautious about keeping a safe distance from a vehicle ahead of you. The current mode is displayed on the multiinformation display.